Left to right: Mark Kostabi, Enasaurs, 1984 (used on the cover of the Ramones album ¡Adios Amigos! 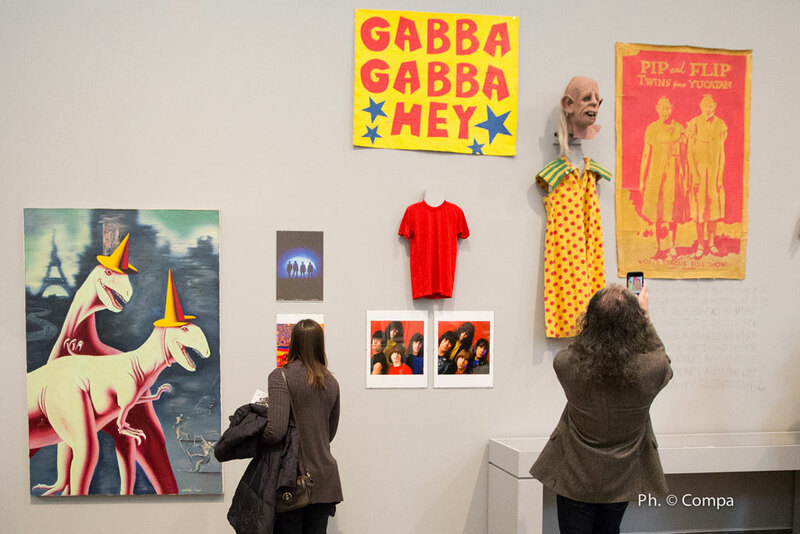 ); George DuBose, Ramones photographs; Mick Rock, photograph and outtake for the cover of End of the Century, 1979; t-shirt worn by Johnny Ramone on the cover of End of the Century; Arturo Vega, “Gabba Gabba Hey” sign, 1996; “Pinhead” mask and dress; Bobby Belfiore, “Pinhead” painting from the rock club Coney Island High. Photograph by Andrea Compa. “Hey! Ho! Let’s Go! Ramones and the Birth of Punk” opened to enthusiastic crowds Sunday, April 10th at the Queens Museum. Upwards of 3,500 people attended, breaking the museum’s record and creating 90-minute waits to get into the exhibition. Co-curated by Gallery 98’s Marc H. Miller and open through July 31, the multi-media exhibition not only tells the story of the Ramones, but also puts special emphasis on the explosion of visual art that surrounded the rise of New York punk from the 1970s through today. The exhibition features over 350 pieces of art, photography, ephemera, memorabilia, and video. 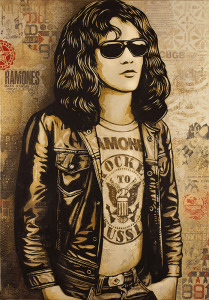 Shepard Fairey, Tommy Ramone, 2016. Courtesy the artist / OBEY Giant, Inc. Among the artists represented are: Sergio Aragonés, Bob Gruen, Fly-O, Curt Hoppe, Bradley Castellanos, Arturo Vega, Roberta Bayley, Keith Green, Matt Groening, John Holmstrom, Legs McNeil, Jenny Lens, George Seminara, Charles Burns, George DuBose, Stephen Kroninger, Mick Rock, Geoff Davidson, Joey Ramone, Dee Dee Ramone, Paul Kostabi, Bettie Ringma, Haoyan of America, Richard Hambleton, Mark Kostabi, Godlis, and Danny Fields. Curt Hoppe, Arturo Vega, 2010. Vega, the Ramones’ art director, designed their iconic logo. Naoshi Sunae, Shining Full Moon -Crazy Stars- (detail), 2016. 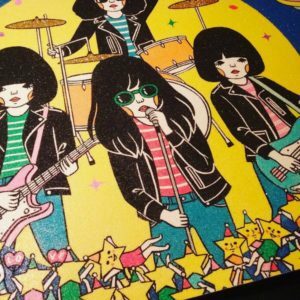 From a display of riquiño (“cute”) art about the Ramones. Stephen Kroninger, Joey Ramone, 2001. 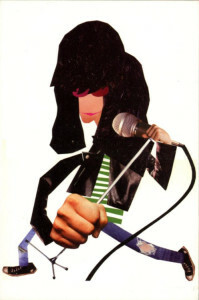 A commemorative collage created for the Joey Ramone Foundation after the singer’s death.